Hostelworld travellers have said the staff of Carpe Noctem offer 'awesome off-the-beaten-track tips to explore the city and are always willing to go the extra mile to help us find something exciting to do, ensure we get proper wrecked and feed our lush hangovers'. 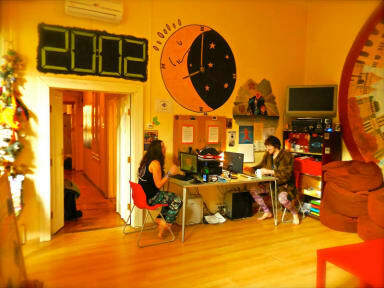 It's no wonder our users voted this hostel the most popular in Budapest at the 2011 Hoscars. This small, lively and sociable hostel offers spacious rooms in the very centre of the city, near Andrassy utca and Nyugati station - ideal for those arriving from the airport. Carpe Noctem is the most social, fun and loving hostel ive ever stayed at. Big thank you to Sunshine, Mouse, B-Slap and Bug for making my stay amazing! Its worth the trip to Budapest just to stay here. Thanks for everything guys! Loved this hotel. Definitely the best hostel I’ve stayed at so far. This is the place to be if you want to experience the best of what Budapest has to offer. The staff is awesome (B-slap, bug, mouse and SS- you guys are the best 🙌🙌). They make you feel welcome as soon as you step into the hostel. Highly recommended for solo travelers. Great for meeting new people over evening dinners, drinking games, boozy fun followed by partying. A truly incredible place! The staff make you feel like family from the moment you walk in the door. Cheap and delicious family dinners, free breakfast supplies, perfect location, super clean and comfy, plenty of activities (by which I mean partying). That said, it's a party hostel, so be prepared! But everyone leaves by 8:30 each night, so if you don't feel like going out you don't have to worry about noise... until they come back ;) The perfect mix of a party atmosphere and a place to relax! Hands down the best hostel in Budapest. The space was intimate which made it absolutely ideal for solo travel. The nightly drinking games followed by their nightly outings made for an unforgettable experience. A big shout out to Mouse for convincing me to go out on the booze cruise and party bus!! Can’t wait to stay with Carpe Noctem next time I’m in Budapest!! Best hostel I've stayed at in Europe! Awesome place. All the staff and travelers are super friendly. If you want to make friends and party in Budapest, but want to be able to get a good sleep at night, this is the place for you. The best hostel I could have stayed. The place is really clean and close to the main tourist attractions. They have and respect quiet hours, which helped me to sleep for some hours after the parties. The staff is always there to make your days in Budapest amazing. Excellent food at night for a good price and really funny drinking games. Would defenitely stay there again! I think that what guests really appreciate about our hostel is that we offer a community experience for solo travellers.They come here to meet new friends and be part of a community while visiting Budapest. Our staff will welcome you with a tea/coffee on arrival and tell you what there is to see and do in the city during the day and then take you out to see the city at night. We really have a sociable environment where everyone gets involved in a number of different activities.